All of my life really, has been a journey towards trust. Trust that the forces of the Universe are conspiring to support me, not betray me. I get lessons big and small, all the time. Right now though, I want to talk about one particular lesson. A few years ago, it was time to build our Dance Arbor and we were scratching our heads wondering how to pay for that. We needed a backhoe to contour the land, and treated wood for the structure, shade cloth to cover it and of course……a ceremonial drum! That year, we had a drum vision quest in February inside the Peace Chamber. A lovely woman came from CA to join us, she sent us $2000 initially saying the extra money was to help anyone else who wanted to come. Now we were asking about $150 for the whole weekend so that was a LOT extra. Jack and I were ecstatic since that was definitely enough to get the backhoe to get started. After the weekend was over and everyone had left – Jack mentioned there was a card down on the Altar in the Chamber and when we looked there were 4 more checks for $2000 each. At that moment, my heart was filled with gratitude and awe to see how our needs could be met in such an unexpected way. You might ask yourself what this has to do with the drum and trust, well…..I had a drum made at a “discounted” price that year by someone I trust and love who was doing me a favor. What was I thinking you might ask, well – I wasn’t thinking, I was in fear that we might not have enough money to do that first dance, that it might not be “perfect” and that of course is another conversation….one for another time. I thought I was doing the right thing but what is interesting is that the drum, although beautiful, has never been quite right. Strapping has broken, the frame warped into the shape of the chamber (pretty awesome) and the sound wasn’t what we hoped. To be fair, the drum was made on the east coast where conditions are very different than in Tucson. But that drum had lessons to teach us. This also ties into holding these wonderful Vision Quest dances on our land, we receive what we need to do this deep and powerful work. How many dancers is enough? Can we cover all the costs involved? These are some of the fears I have and each year, I’m shown again and again….that it all works out. Well this past year, I’ve realized that we need a new drum and I knew just the person to ask. 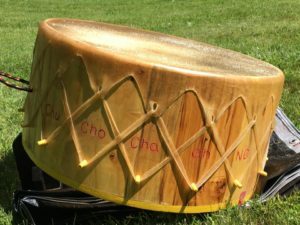 This drum is made from cottonwood from our beloved teacher’s land and it’s also being made in such a way that it can handle our very dry climate. The cost of this new drum is $900 and some of that money came to me almost right away, but I’m telling you this tale to see if you can find it in your hearts to help with the rest. It can be $20 or $5 or $100 – it all depends on what you feel you want to send. “It is the ability to accept all feelings and opinions without denying any emotion or thought.” This is what jumped out for me and it is a pretty tall order if you think about it, but a worthy goal and something to strive for. Blue Heron was the card I selected this morning during morning meditation. This bit of the reading is for the upright position but the card was upside down and it was the only card in the deck that was in that position! SO, the contrary message is to not do too much self-reflection as it can lead to self-obsession and too much criticism. It is reminding me that wholeness can not be attained in one deep dive but that we must also resurface for air! I liked both messages, and can say that lately I’ve been feeling the need for a deep dive into old stuff that still needs to find expression and to be released. It is fortunate that I have some very good friends in my life that help me to see things when I need to, and remind me of tools I have but had forgotten. It is also my joy to offer that to others, along with personalized ceremony and Flower Essences to assist in those shifts we all need to make from time to time. It’s what makes us human. As human’s it is our nature to crystallize in our thinking and it is also in our nature to grow and change but sometimes we need a little help. If you’d like to schedule a time to talk to me, to see if there may be a way for me to help with a transition or time of change….let me know and we can get you on the calendar! 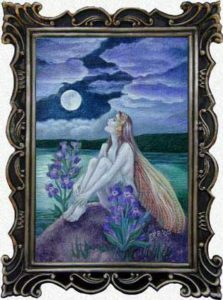 The time is fast approaching for our Sun-Moon Dance and just the thought of being in the Arbor once again makes my heart sing. The dances that our teacher Joseph Rael gifted us with have been instrumental in some major transformations in my own life and if you are curious about the dances – let’s talk! Our dance this year is April 12-15th. You may feel the heart call to Dance or support as a kitchen helper or a Dog Soldier, there are many ways to be a part of something that is almost beyond description and a true gift to us personally and to All the People. Ours is just one of many Visioning dances that take place around the US and around the world so if we aren’t near you, there may be another dance that is a better fit. If you let me know of your interest, I can check and see.